In the next five years, Low Power Wide Area (LPWA) networking technologies such as Sigfox, LoRa®, LTE-M and NB-IoT will connect hundreds of millions of smart city sensing devices to low cost multi-kilometer cloud connected networks. LPWA networks continue to displace existing outdoor networking technologies for metering and streetlight monitoring, but they are also disrupting Internet of Things (IoT) solutions for parking, waste management, smart water networks, geotechnical monitoring, pollution monitoring and bike sharing. Intense competition among network operators and new LPWA network offerings has created a more affordable smart city technology landscape. Unlicensed LPWA IoT network technologies like LoRa and Sigfox have given IoT operators Comcast, Senet, Thinxtra and UnaBiz a significant cost advantage. However, LTE-M and NB-IoT networks are rolling out worldwide by mobile LTE operators, many of which also provide LoRaWAN™ as an alternative for either public or private network use. The recently released LoRaWAN™ 1.1 specification provides several enhancements for network operators targeting smart cities including support for passive and active roaming, class B devices as well as security enhancements. Still, the largest opportunity is LTE networks with its 3GPP’s Release 13 announced last June and NB-IoT with a rapidly growing ecosystem. The inevitability of NB-IoT is not a given as its not suitable for mobile sensing applications, requires new tower installations and has interoperability issues. Smart city LPWA connected devices will increase by 12X over the next five years when there will be over 140 million connections worldwide. Cumulative revenues from LPWA enabled equipment and associated services over this period will surpass $30 billion. 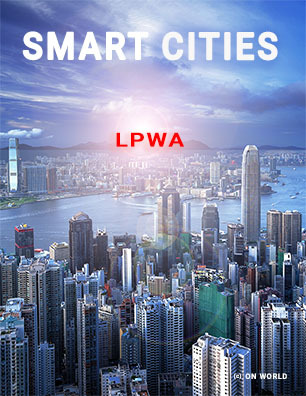 In this report, we cover the growing LPWA market opportunities for smart cities including smart metering (electric, gas and water), smart water networks, transportation, waste management, bike sharing, environmental monitoring, geotechnical monitoring and others. It includes market size forecasts (2016-2022) for connected devices, annual unit shipments and breakdowns by market, application, technology, geography and equipment/services; the results from several surveys; an in-depth technology evaluation; and analysis of the value system with 100+ companies. *The LoRa® Mark is a trademark of Semtech Corporation or its subsidiaries. *LoRa Alliance™ and LoRaWAN™ are marks used under license from the LoRa Alliance. ON World provides business intelligence on Internet of Things markets. Our market research is used by Fortune 1000 companies, startups and investors worldwide.